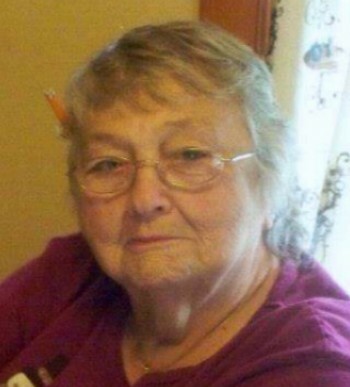 LEWISTON - JoAnn F (Shaw) Whitney, 83, of Lewiston, passed away peacefully on Saturday, May 5, 2018 at Central Maine Medical Center surrounded by her loving family. She was born on July 16, 1934 in South Portland to the late Alice R. (Wendel) Shaw and Robert E. Shaw Sr. JoAnn married Alton E Whitney on January 7, 1956 the love of her life and together they raised one son and four daughters. She was a stay at home mom, then later was a loving day care provider for many of her grandchildren and the neighbor children. During her lifetime she enjoyed spending time with all her family, church and choir, bingo, card games, knitting, painting, camping, most of all traveling with her sister and brother-in-law to many exciting places with Hawaii being her favorite. JoAnn is survived by her loving husband of 63 years, Alton E Whitney of Lewiston and their four daughters; Bonnie (Whitney) Dyro and her husband Dennis of Gray; Julie (Whitney) Busler and her husband Gerald of Nashua NH; Jolyn Whitney and her companion Edwin Fogg of Lewiston; Alice (Whitney) Crawford and her husband Daniel of Auburn; One older sister Catherine (Shaw) Benjamin of Dover Foxcroft. She also leaves a younger sister Sandra (Shaw) Taylor of South Portland; a younger brother Frederick L. Shaw of South Portland as well as fifteen grandchildren, fourteen great-grandchildren and many nieces and nephews. JoAnn was predeceased by her parents; a son Harold E. Whitney; a sister Dorothy (Shaw) Whitney and two brothers Robert E. Shaw Jr. and Charles Shaw. The family would like to thank the staff of doctors, nurses, and therapists at CMMC for giving her much care and compassion during her stay and making it an easier transition for her and our family during this time. Relatives and friends are invited to attend a Memorial Service on Friday, May 11, 2018 at Free Grace Church, 160 Canal Street, Lewiston from 3 - 6 p.m.